The new fabrication process, described in the journal Applied Physics Letters, advances nanoscale metal lithography into three dimensions -- and does it at a resolution high enough to be practical for metamaterials. "If you want a bulk metamaterial for visible and infrared light, you need to embed particles of silver or gold inside a dielectric, and you need to do it in 3D, with high resolution," says lead author Kevin Vora, a graduate student at the Harvard School of Engineering and Applied Sciences (SEAS). "This work demonstrates that we can create silver dots that are disconnected in x, y, and z," Vora says. "There's no other technique that feasibly allows you to do that. 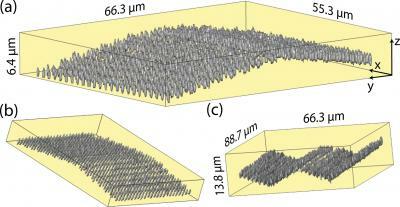 Being able to make patterns of nanostructures in 3D is a very big step towards the goal of making bulk metamaterials." Inside the pocket where that energy is trapped, a chemical reaction can take place, permanently altering the internal structure of the material. 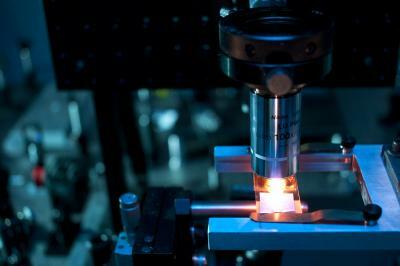 The process has previously been exploited for 2D and simple 3D metal nanofabrication. "Normally, when people use femtosecond lasers in fabrication, they're creating a wood pile structure: something stacked on something else, being supported by something else," explains Mazur. "If you want to make an array of silver dots, however, they can't float in space." The need for this particular combination of chemicals, at the right concentrations, was not obvious in prior work. Researchers sometimes combine silver nitrate with water in order to create silver nanostructures, but that process provides no structural support for a 3D pattern. Another process combines silver nitrate, water, PVP, and ethanol, but the samples darken and degrade very quickly by producing silver crystals throughout the polymer. With ethanol, the reaction happens too quickly and uncontrollably. Mazur's team needed nanoscale crystals, precisely distributed and isolated in 3D. 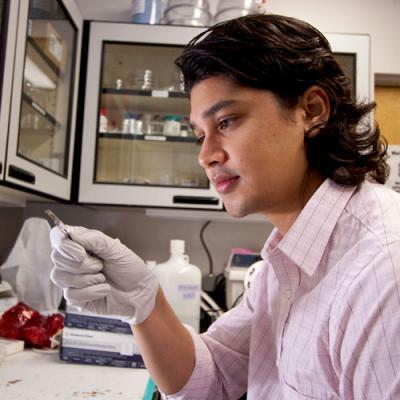 "It was just a question of removing that reagent, and we got lucky," Vora says. "What was most surprising about it was how simple it is. It was a matter of using less." SeungYeon Kang, a graduate student at SEAS, and Shobha Shukla, a former postdoctoral fellow, coauthored the paper. The work was supported by the Air Force Office of Scientific Research.